Product prices and availability are accurate as of 2019-04-21 23:04:36 UTC and are subject to change. Any price and availability information displayed on http://www.amazon.com/ at the time of purchase will apply to the purchase of this product. Say hello to naturally friendly activated charcoal fluoride free whitening toothpaste. This black paste is thoughtfully formulated with high quality ingredients like fresh mint, coconut oil, xylitol and activated charcoal (made from sustainable bamboo) that whiten naturally and gently without peroxide. The activated charcoal also works as a natural detoxifier to polish and clean, whiten, remove surface stains and freshen breath. 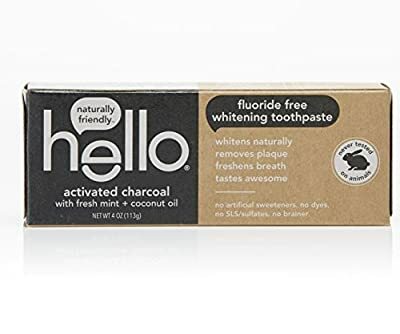 But buckle-up, there's more goodness: hello contains no peroxide, no artificial sweeteners, no artificial flavors, no synthetic dyes, no microbeads, no parabens, no sls/sulfates and no gluten. As if that weren't enough magic for one tube, hello is also vegan, never tested on animals (Leaping Bunny Certified and PETA recognized), and made in the USA. We're serious about being friendly, and about what goes into our paste.